Being born into a family-owned business empire has its advantages. You usually know what you’re going to do and there is a strong support system to back early, faltering decisions, if any. But that did not make the prospect any less daunting for Shashwat Goenka. Consider the shoes he had to fill. Goenka’s grandfather is the late Rama Prasad Goenka, founder of the RPG Group, who was famously known as India’s ‘takeover king’ because of his penchant for acquisitions. RP Goenka’s son Sanjiv—now chairman of the RP-Sanjiv Goenka Group—oversees businesses which include the 166-year-old power utility giant CESC and its subsidiary, the Kolkata-based supermarket chain Spencer’s Retail, which the Wharton-educated Shashwat looks after as sector head (retail) of the group. It is a tough assignment too. 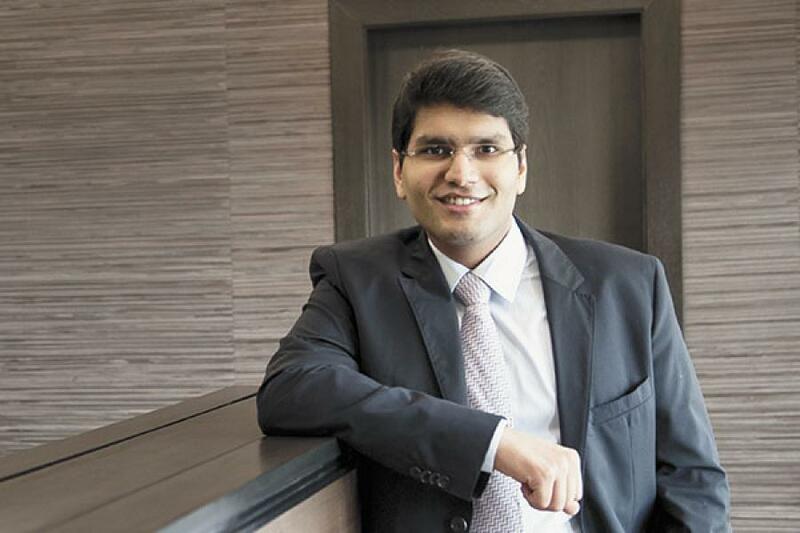 In 2013, Shashwat, at 23, was given the responsibility to take over Spencer’s Retail by his father, who ranks 97 on the 2015 Forbes India Rich List with a net worth of $1.17 billion. The supermarket chain had been acquired in 1989 by the erstwhile RPG Group and despite being one of the first movers in the Indian retail space, it had been bleeding money for several years. His mandate was clear: Make it profitable. Although Spencer’s Retail, which comes under CESC, is yet to turn profitable, its losses have narrowed. The retail major’s net loss shrunk to around Rs 151.6 crore in FY2015 from Rs 209.1 crore in FY2013, when Shashwat took over, according to financial figures posted on parent company CESC’s website. Revenues, meanwhile, have grown to Rs 1,671.9 crore in FY2015 from Rs 1,347 crore in FY2013. One of the first decisions he took was to simplify and streamline the organisational structure. “It’s a very dynamic industry, and so we needed to enable faster decision making by reducing the bureaucracy,” he says. Other changes were made: From looking for solutions to prevent theft and pilferage to reducing energy consumption. “We transitioned from CFLs to LEDs. We also looked at using geo-thermal energy and solar power in some outlets,” he says. One Spencer’s outlet in Hyderabad is completely run on solar power, Shashwat adds. Importantly, under him, Spencer’s Retail has now shifted from running a combination of small local stores and hypermarkets, to focusing on hypermarkets. 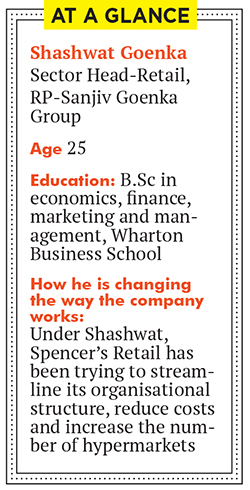 Although he sits on the board of a number of companies in the RP-Sanjiv Goenka Group, Shashwat insists that for now, Spencer’s Retail will remain a priority for him. The focus will continue to be to improve operations and growth. “Each year, we intend to add about 10-15 hypermarkets,” he says. According to its website, Spencer’s Retail runs 135 stores across the country, including 35 hypermarkets.